In this post, a series of standard linear models will be fitted to a small selection of fundamental economic data I managed to scrape off the internet. The In-sample forecast performance of the Purchasing Power Parity model, Uncovered interest parity model, Dornbusch-Frankel model (with share prices) and the Bayesian averaging model shall be assessed using the standard RMSE measure of forecast accuracy. Requisite data was collected for two currency pairs : GBP/USD and CAD/USD. Instead of differentiating between different types of non-stationarity in the time series of the variables, I simply fitted the model with a variety of assumptions and plotted the results. In both cases, the more complicated Vector Error Correction specifications of the candidate models are found to be inferior to the simpler Vector Autoregression models. 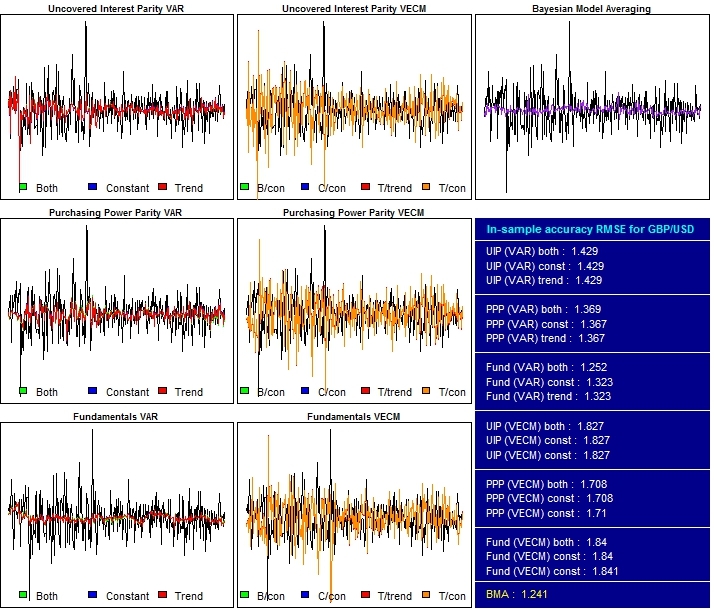 The Bayesian Model Averaging technique provided the lowest RMSE for CAD/USD and the second best measure for the GBP/USD pair, a result that speaks in favour of the difficulty encountered when linking exchange rate returns to economic fundamentals with any consistency. 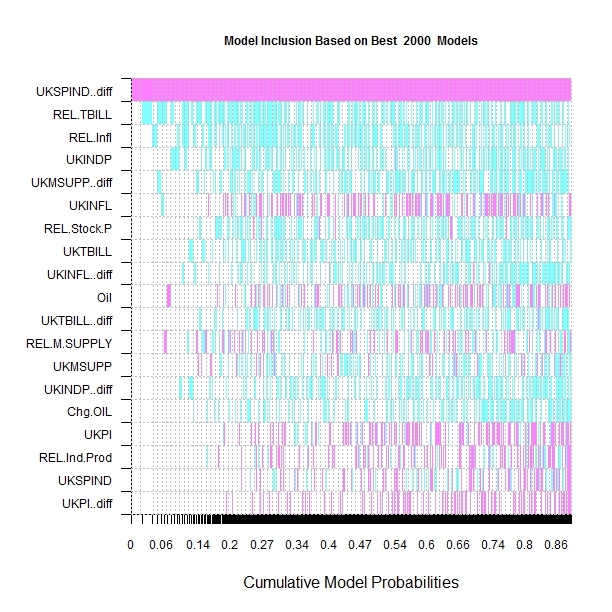 Given model uncertainty in the number of underlying candidate models, the BMA technique helps us select different combinations of underlying models based on performance. 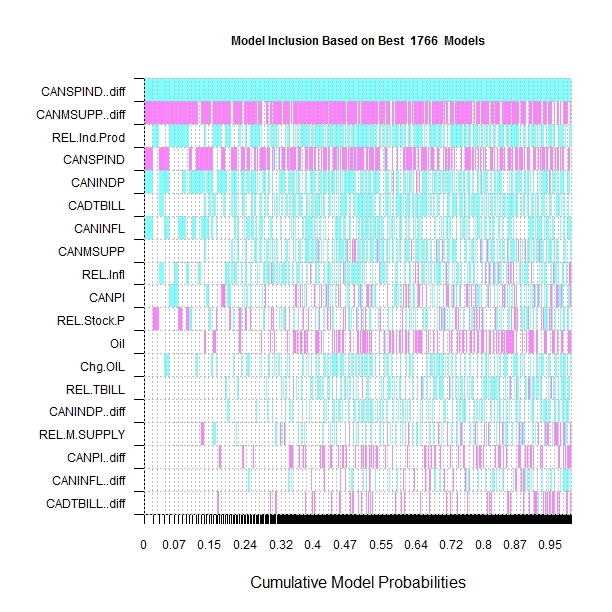 By averaging over many different competing models, BMA incorporates model uncertainty into conclusions about parameters and prediction.For k potential variables, the BMA technique implies estimating 2^k variable combinations and thus 2^K models. The model weights for this averaging stem from posterior model probabilities that arise from Bayes’ theorem. 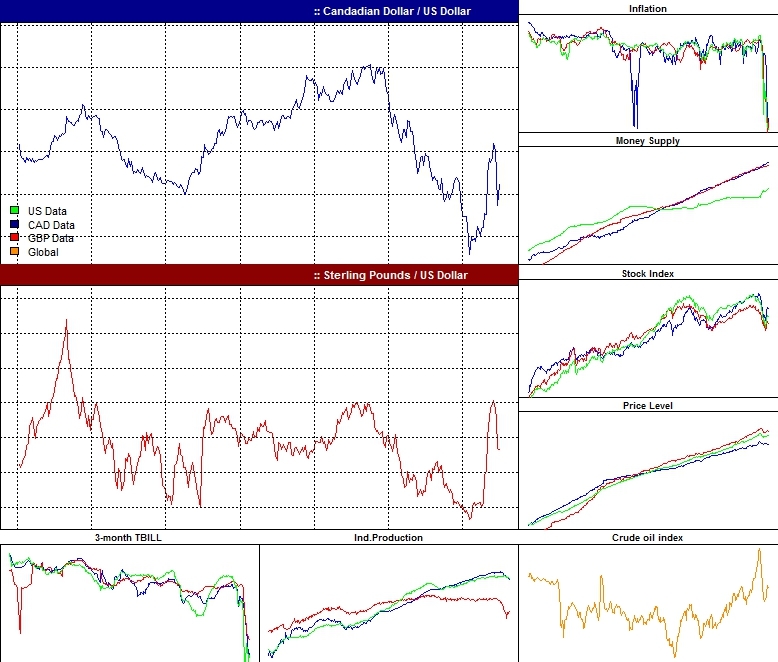 Let’s first load the data and plot the demeaned logarithmic data for the 2 currency pairs and 3 countries. After ascertaining nonstationarity for all the variables, the aforementioned models were fitted to the data. A selection of the code which deals with the BMA and a plot of the in-sample fitted values follows. The code is far from elegant but I am not fussed as long as it works. From the following plot associated with the BMA technique, we can see that the best model that explains CAD/USD returns contains 5 variables :  Change in Canadian share price index,  Change in money supply,  Canadian Industrial Production,  Canadian share price index,  Canadian Inflation. The white rectangles represent omitted variables, the blue rectangles suggest a negative relation between the dependent and the particular explanatory variables while the pink shades suggest a positive relation. There is also some consistency across the best 1766 models in terms of the relation between exchange rates and fundamental variables. The change in the Canadian share price index appears to have a negative impact on exchange rate returns, implying perhaps an appreciation of the CAD relative to the USD when the change in Canadian shares is positive. This relation appears to hold true for all the best models. A different picture emerges for the GBP/USD currency pair, where the best model contains only one variable:  Change in share price index. The GBP T-Bill differential appears to be quite important in explaining GBP/USD returns across the best 2000 models, bearing a negative relation against exchange rate returns. The greater the T-bill differential, the more attractive are CAD deposits, the greater the demand for CAD dollars relative to USD, the greater the chances of CAD appreciation and hence a decline in CAD/USD returns. 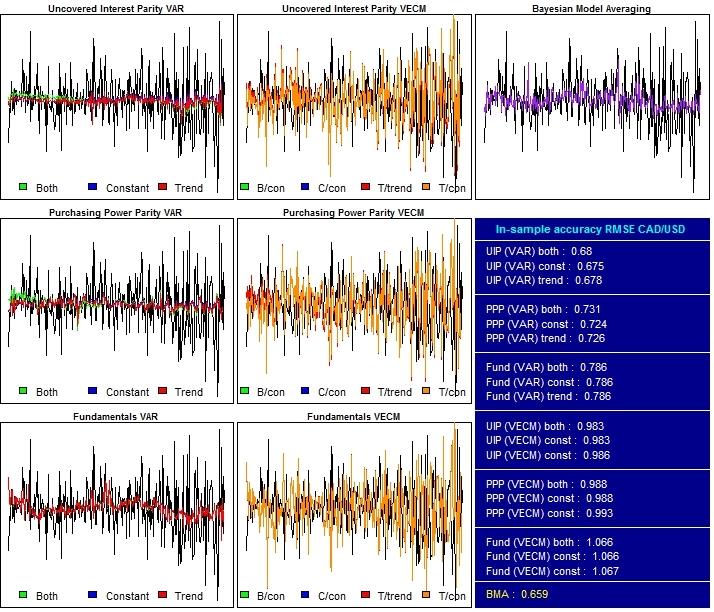 The following set of plots show fitted model values and actual data along with the RMSEs associated with each specification. The Bayesian Model Averaging technique appears to outperform other models for both currency pairs. Unfortunately, the more complicated VECM specifications of the models are inferior to their VAR counterparts. There is no particular consistency in terms of performance. The only consolation lies in the BMA’s out performance across currency pairs and models.